Why I have STOPPED Keeping Up With The Kardashians! Hello all my favorite people!! Today I want to write to you about something that upset me greatly! I am sure that you all have heard of the Kardashians, the three famous sisters on E’s Keeping up with The Kardashians reality show. I was never a huge fan, but I always choose to see the good in everyone and look on the positive side of life. However today I saw something that honestly I couldn’t ignore!! Look at the picture bellow! 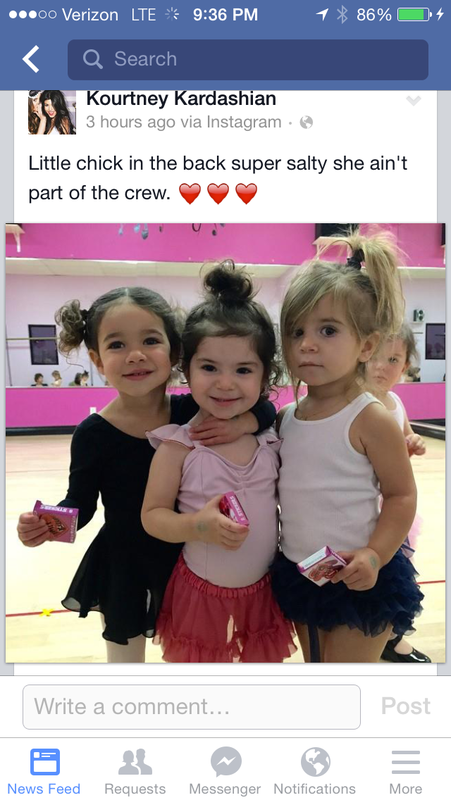 So cute right, Kourtney posted this picture of her daughter Penelope and her friends. I am a sucker for little kid pictures I must admit I think they’re adorable. BUT then I read the caption. “Little chick in the back super salty she ain’t part of the crew” Honestly its so mean Its disturbing! To comment negatively on a small child’s appearance just for a joke or attention is probably one of the most immature and cruel things I have ever seen. Kourtney is one of those women who is always in the public eye, she’s a Kardashian. So I’m sure that she has been the target of many cruel jokes and comments. I do not know why anyone would think this type of behavior is okay, but she definitely should know better. The girl in the back is beautiful and angelic, she is a child and deserves respect. To me a person who would treat anyone like this never mind a child needs to learn how to respect others and be kind. Needless to say, I will never again be keeping up with the Kardashians again!! I apologize for this rant. I realize that most of my posts are positive and upbeat however I felt like this needed to be addressed! You are right this is beyond wrong! It makes me sad that someone who has such power over people like Kourtney would act so cruel towards a small child! Thank you! I think that its sad when celebrities choose to act like this it just because they are so many peoples role models and people idolize their behavior! I can’t believe this post its so mean! Im so glad you have the guts to post about things like this, She may be doing harm by acting like this but at least you are doing good! Oh wow and out of all the celebrities in the face of paparazzi and media backlash you would think that Kourtney Kardashian would be the LAST person to ridicule another person LET ALONE A YOUNG CHILD! What does being ‘super salty’ even mean?? I feel the same as you! Its hard to continue to like a show when you lose respect for one of the stars of the show. I noticed this post on Kourtneys Instagram and was also disgusted! I have unfollowed her. It’s so disappointing to see a parent behave like that so publicly, I was a fan before but not now. I’m surprised there hasn’t been more about this in the media- usually a Kardashian sneezes and its on the front page… Cyber bullying a child is surely news worthy?! Thanks for the comment!! This was the same way I reacted! A parent surely would have to think what if someone said that about my child! I have also unfollowed her but before I did I noticed a lot of people commenting on how rude it was I hope she is at least a big enough person to apologize to the family of this little girl! I noticed the picture has now been removed so hopefully she has realised how thoughtless a comment it was! Her daughter and her friends looked so adorable, it seems such a shame to ruin the picture with an unnecessary comment like that! Just discovered your blog- great idea!